While the fierce rivalry between Marc Marquez and Valentino Rossi might be something that’s only just came into the public eye after their encounters on-track in MotoGP this season, culminating last weekend in Sepang, Australian Supercross legend Chad Reed says it’s nothing new to the pair. 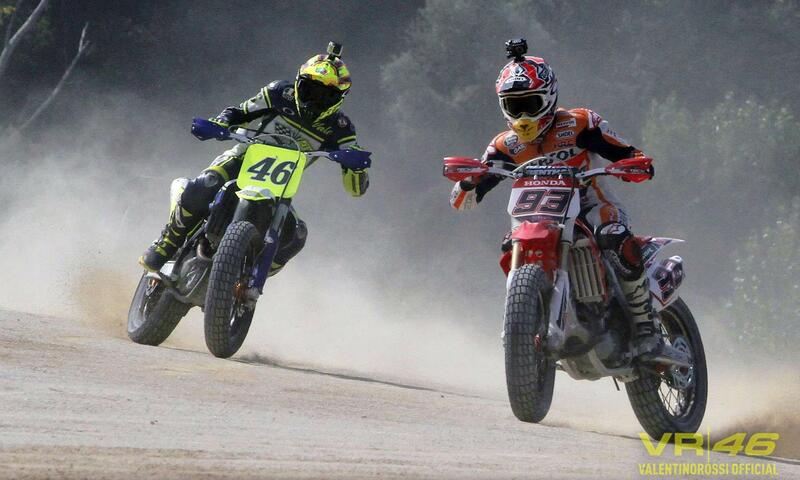 Speaking to MCN earlier this year, Reed says he was amazed at the level of competition between the pair when he headed for a day out with them to Rossi’s VR46 Ranch for a day of flat tracking after last year’s Misano Grand Prix. “I can tell you right now – we rode there the Tuesday after Misano, Marquez in the leathers he had crashed in, Vale still hung over – and they were literally ready to die to set the fastest lap! While the day, which also saw Bradley Smith and Loris Capirossi among some of the attendees, was before the newfound bad blood between Rossi and Marquez. Paddock insiders have since said that they believe the day marked the start of a change in the relationship, when Marquez arrived with some of his Repsol Honda crew to set up his bike in an effort to ensure he beat Rossi on home soil. Going against the ethos of Rossi’s home-built track as somewhere for fun and friendly competition, the move was said to have infuriated not only the Italian, but a number of other riders that were present on the day.